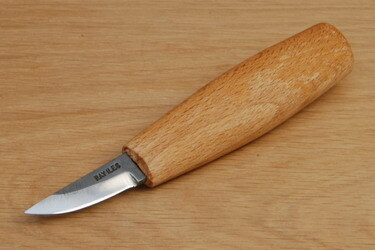 Sloyd is the Swedish name for craft, and this lovely knife from Ben Orford is ideal for carving and craft work where the need for the strength of a full tang is not required. The razor sharp blade is 4" (100mm) long, made from 2mm thick steel and approx 1/2" (13mm) deep. It is supplied with a simple leather blade cover. Also available in shorter versions.